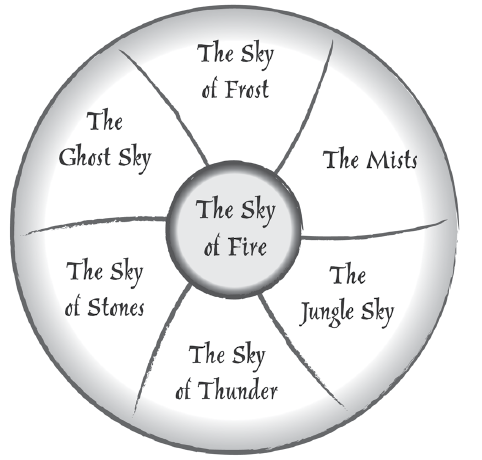 The 7 Skies all have differing natures, and they rotate counter-clockwise around the World. Each brings — in part or in whole — a season to the Cloud-Islands of the World, which float in their fixed positions. The Ghost Sky: (late autumn) The cool winds of the Ghost Sky are eerily barren, and — some say — haunted. The Jungle Sky: ((late spring) A riot of wheeltrees and warming weather, the Jungle Sky is teeming with life. The Mists: (early spring) Dense shoals of fog, with vast clearings within. Only a cautious captain can travel safely through The Mists. The Sky of Fire: (center of the World) Dangerous! — objects entering the Sky of Fire will burst into flame! The Sky of Frost: (winter) The snow and hail of the Sky of Frost threaten to freeze any skysailors solid who attempt to travel through it. The Sky of Stones: (early autumn) Hurling rocks, falling temperatures, mining encampments, and sky-gyspies are the hallmarks of the Sky of Stones. The Sky of Thunder: (summer) Terrible thunderstorms. Do not attempt to travel through the Sky of Thunder, unless your need is great. 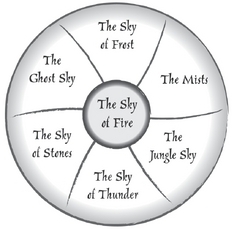 Detailed information on the 7 Skies can be found in S7S, Chapter 1, p. 8-20. See also the Dome of the Heavens. If you're a Griffin (like me), you can punch ghosts. It makes this Sky less fearful, trust me. A bosun under my command died while we were in this Sky. I still worry he is trapped there, forever. Gliding Mice are a common sight in this Sky. The Silver Tentacles is the name of a small wheeltree grove with strange white foliage (instead of the typical blue-green). Renowned as one of the most beautiful and romantic spots in the World, the pale leaves of the trees glow in the moonlight. Empyrean Wolves and Icosapus are said to roam this Sky. Too complicated to visit. All of that mystic power wasted, just to visit a desert of the Skies? Pfft! Personally, I enjoy flights through the Sky of Frost. The risk sweetens the venture. In my opinion, chicks, the Sky of Stones is the most dangerous region of the 7 Skies. Too many factions, all with their own agendas, cloaked my massive floating boulders. I have wrestled the thunderbird. I, thus, have no fear.